Only a particular person could embody the character of a mother that murders her two children in cold blood and gains the audience’s’ sympathies. In The Medea Effect, show director Ugo is desperately looking for a woman talented enough to play the main character in his rendition of the ancient Greek tragedy Medea. Concordia Theatre graduate Emma Tibaldo directed this play, originally written by Québécois playwright Suzie Bastien and translated by Nadine Descrochers. The plot revolves around two characters scarred with family abandonment issues and an inability to be understood or to be heard. Each of them is obsessed with the classic Greek heroine Medea. Through dialogue and compassion, they unveil their own personal demons and the reasons for their attachment to the play. The central character of Euripedes’ tragedy, Medea, is heartbroken and alone after her husband Jason leaves her to marry another woman. As revenge, she kills her two children and his fiancée in order to inflict upon him the most pain imaginable. Medea’s filicide doesn’t come from a place of hysteria but rather from one of clarity. She understands the magnitude and repercussions of this unforgivable act. The abandonment she felt when her husband left her coupled with her inability to change the situation left her with only one option. The character is often praised for her revolt against the male-dominated oppression she faces throughout the story. In Tibaldo’s rendition of the play, an exhausted director has gone through countless auditions to find the right woman to play Medea. To appropriately display the range of this character, an individual would have to reach deep into their consciousness and externalize their most personal conflicts. Ugo, however, can’t find anyone capable of handling it. After a fruitless day of auditions, Ada, played by Jennifer Morehouse, arrives uninvited in an attempt to convince Ugo of her worthiness to play the part. Exhausted and annoyed, her encounter is met with hostility. Ugo ultimately recognizes Ada as the actor who played Medea 10 years earlier, only to infamously walk off stage during a performance. As the two characters become more intimate with one another, they recount each other’s deceits. “It’s not about forgiveness; it’s more about being heard. In this play, they ask to be heard,” said Tibaldo. The story of Medea attempts to send a similar message. Her ability to grasp and articulate to audiences the thought process behind her actions allows the viewer to sympathize with her. 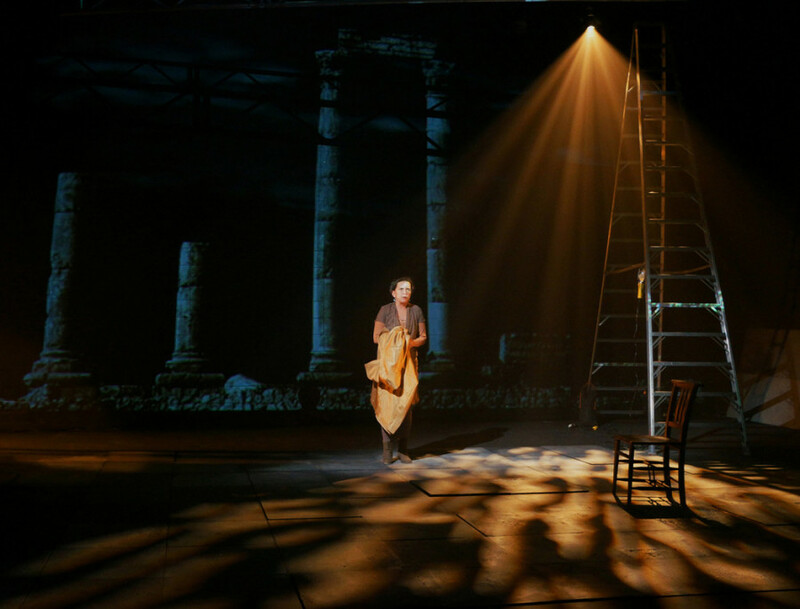 “The base of all modern drama is Greek theatre and to sort of see that in a modern context is very appealing and entertaining, “ said James Loye, who plays Ugo. The set design is minimal, creating a space of simplicity and emptiness that encourages the audience to focus and listen. The stage contains only a tall ladder and a few chairs, while the players express themselves through dialogue and movement. The drama of the play is created through distances, pacing and the timing of the actors. Much like the character she plays, Jennifer Morehouse had previously played Ada in an earlier incarnation of the play. She described the difference of revisiting the same character. Loye, who is a recent addition, only had a short time to prepare for the play. Regardless, director Emma Tibaldo couldn’t be happier with the actor. “He’s done a great job and he’s only been rehearsing for two weeks,” she said. The Talisman Theatre produced the play. The production company’s main objective is to translate French-language Québécois plays and bring them to an English audience. This is Tibaldo’s second stint directing this show after a successful run in 2012, which earned nominations including Outstanding Production and Outstanding Direction from the Montreal English Theatre Awards. _The Medea Effec_t // Feb. 3—Feb. 7 // Segal Centre for Performing Arts (5170 Côte Ste-Catherine Rd.) // $18 adv. // 8 p.m.